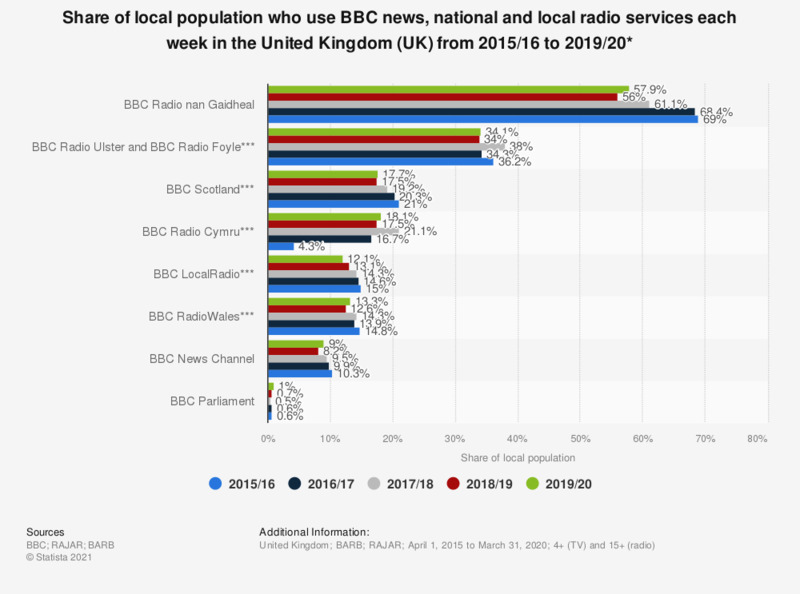 This statistic displays the weekly reach of BBC news and national and local radio services in the United Kingdom (UK) from fiscal year 2015/16 to 2017/18, based on the services' local population. In the fiscal year ending March 31, 2017, BBC Radio nan Galdheal had the greatest weekly reach, with 61.1 percent of the population using the service at least once. * The source defines reach as: "15 minutes for all channels and services on audiences aged 4+ (TV) and 15+ (radio)"
*** Data based on these services' Total Survey Area (TSA). ‡ Source: Lèirsinn for the BBC. Base: Gaelic-speaking 16+ population. Data for years prior to 2015 were published earlier by the source.